Advert for the proposed new state for the Nupe people, originally uploaded by nobodaddy69. 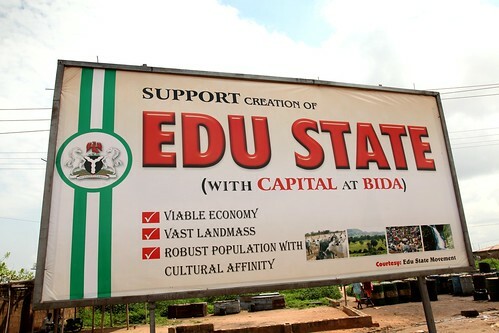 "Edu" means river in the Nupe language. The middle and upper classes there talk so much rubbish. State creation is a waste scarce resources and results in the unnecessary duplication of institutions (all non-oil producing states derive the bulk of their revenue from federal handouts, so who are the kidding – viable economy indeed). If this sentiment were taken to it’s logical conclusion there would be over 200 states in Nigeria, one for each ethnic group. Is this feasible or even sensible not to mention sustainable? Yet this is what those in the know are advocating. Why can’t the local elites learn to co-operate and reach a mutually beneficial agreement? People should learn to grow up, and stop dwelling on the superficial differences. If everyone would think like that, Obama would have never become the president of the United States. They say the proposed Edu state has a “vast landmass”, I hate to think what they would call a state the size of Western Australia (which is many times more bigger than the whole of Nigeria), a whole lot richer too. I don’t see people there clamoring for needless division. I agree with CodLiverOil up here. A new state will mean another state house of assembly, state governor, state commissioners and their assistants, plus the commissioners' entourages. This is asking too much. Can proposed Edu state pay all those people from its own coffers? I strongly doubt it. State creation is a waste of scarce resources.You create a new set of minorities that would end up demanding their own state tomorrow.If the argument is that state creation spreads development,then let us turn the states into local governments. Please check out my blog:http://henryik2009.wordpress.com.